This book brings together, for the first time under a single cover, international comparisons of the major topics in sports economics. Contributors are all renowned scholars of the international sports scene in Australia, New Zealand, Brazil, the Pacific Rim, North America, and Europe. The reader will find an overview of sports in particular countries and regions along with comparisons along the major topics of economic importance. In particular, the contributions compare and contrast revenues and costs, labor markets (restrictions and discrimination), market structures (league and association organizations) and outcomes (team profitability and competitive balance), and policy issues (especially competition policy). Aimed primarily at sports scholars, practicing sports professionals, and policymakers, the volume is also well suited for undergraduate sports economics, sports management, and sports law courses. 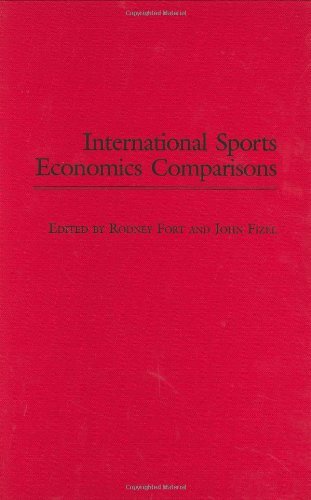 Compares and contrasts revenues and costs, labor markets, market structures and outcomes, and policy issues in sports economics around the world. RODNEY FORT is Professor of Economics at Washington State University. The author of dozens of articles and monographs on sports economics, he serves on the editorial board of the Journal of Sports Economics. He is a regular speaker and panel participant on sports issues in the United States and Europe, and he has testified before the U.S. Senate on competitive balance issues and often renders expert opinion in legal cases in the United States. JOHN FIZEL is Professor of Economics and Chair of the iMBA program at Penn State University. He conducts research in applied microeconomic topics that have included online auctions, nursing home efficiency, and the economics of sports. He is co-editor of Baseball Economics (Praeger, 1996) and Sports Economics (Praeger, 1999).